Preheat oven to 180°C (160° if using fan-forced oven). Line a baking sheet with Goliath baking paper. Peel the pears, being careful to leave the stem in, and then set aside. In a medium saucepan, combine water, sugar and honey; bring to a simmer over medium-high heat. Once the sugar has dissolved, add the pears, lemon juice, cinnamon sticks, cloves and vanilla. Simmer until the pears are fork tender, about 30 minutes. Once the pears are tender, remove from heat and allow to cool. Simmer the poaching liquid until reduced to ½ cup. 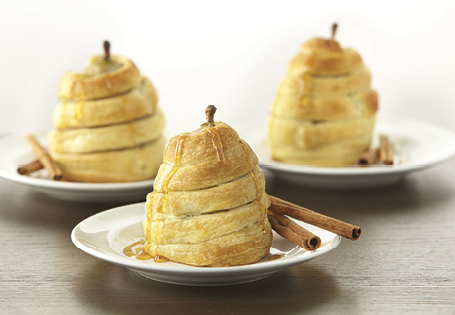 Cut pastry into 1cm strips and wrap around pears, starting at the base and working up to the top. Place pears on prepared baking sheet. Bake 15-20 minutes, or until golden brown. Serve with a drizzle of the poaching reduction.